MP511 Benchtop pH/mV/Temp Meter - Oasis Scientific Inc.
· Large dual-display LCD shows pH (or mV) and °C/°F temperature. · Offers a full complement of GLP-related features, such as serial number, data logging with time/date stamp, etc. · Advanced setup mode lets user customize meter parameters. 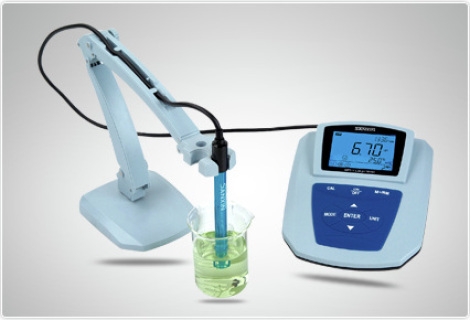 · Three-point pH calibration with automatic or manual temperature compensation. · Auto-buffer recognition of USA or NIST buffer sets. · Ready indicator shows when reading has stabilized. · Diagnostic error messages alert user of problems. · Built-in real–time clock with date/time. · The time interval for each pH measurement can be set (0-99 min), with data being stored automatically. · Memory function stores and recalls up to 600 data sets with time/date stamp. · Meter can also store data of last calibration with date and time. · Included Windows*-compatible software allows user to download data to printer or computer via RS-232 interface. · Splashproof and dustproof, meets IP54 standard. communication cable, MP511 communication software CD, Operation manual.